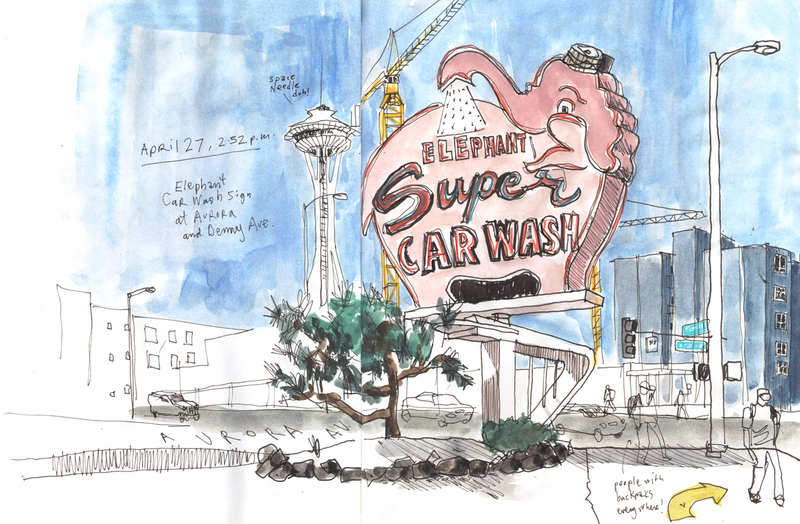 The Elephant Car Wash on Battery Street opened in 1956. I’m not sure how cool its rotating elephant sign must have been back then, 13 years before I was born. It looks really cool to me now. Kitschy but cool. To me, this one passes the ugliness test that Aurora Avenue does not. Digging for information, I found the business started in Seattle in 1951 and has locations in Eastern Washington, Arkansas and California. One of those California locations must surely be in Rancho Mirage — I used to drive past a nearly identical pink squirting elephant sign when I lived in nearby Palm Springs. Update: Mike Hakala, the owner of the Battery Street car wash location, just called me back (thanks Mike!) He says the sign is “probably the most photographed car wash sign in the country. People come from all over and have their photo taken in front of it.” It has been in a Nike commercial and the Secret Service once stopped with an entourage of six vehicles, he said. To him, the reason why people like it so much is because “is unique, not an obtrusive low-end deal. The pink stands out nicely.” Another interesting factoid: the rotating motor inside stops if the wind blows very hard. That’s something I wondered as I sketched it on Monday. It seemed to move very fast!